Will Kurdish Vote Trigger Yet Another War in Iraq? FILE - A member of the Kurdish security forces scans the horizon in Kirkuk, Iraq, from atop a military vehicle flying a flag of the Kurdistan Regional Government, June 14, 2014. It is rare for the United States and Iran to agree on anything but this week both Washington and Tehran have been scrambling to try to dissuade the president of Iraqi Kurdistan, Masoud Barzani, from holding a referendum on independence. Their vehement opposition to an independence vote partly stems from their concerns about each other. Tehran worries that an independent Iraqi Kurdistan will cleave ever closer to America and the West, while Washington is anxious that the referendum will trigger war between Iraq’s Shi’ite militias and the Kurds, a conflict that would likely end up splintering Iraq, which the United States has spent considerable effort trying to bolster, and distract from the U.S. priority of defeating the Islamic State terror group. FILE - Fighters from Badr Brigades Shiite militia clash with Islamic State group militants at the front line on the outskirts of Fallujah, Anbar province, Iraq, June 1, 2015. Their efforts — along with the wider international community — to get the vote postponed appears destined to fail. Barzani remains defiant. The Kurds, after more than a century of conflict with neighbors, mass atrocities and genocide, feel this is their moment and all the main parties in Kurdistan are backing the referendum. It will be hard — if not impossible — for Barzani to halt the plebiscite now. At first glance war appears in the offing. Tensions are building fast with mounting concerns that the referendum will lead to a new spiral of violence in Iraq even before the country has finally rid itself of Islamic State. Iran — along with Turkey, which worries the vote will encourage their own separatists Kurds — threatened this week to launch a blockade of Iraqi Kurdistan, if the referendum happens. 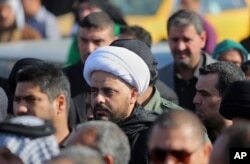 FILE - Qais al-Khazali, center, the leader of the Shi'ite group Asa'ib Ahl al-Haq, or League of the Righteous, attends a funeral procession of six members of his militia who were killed in Tikrit fighting Islamic militants. To add emphasis to the warning, Qais al-Khazali, leader of a pro-Iranian Shi’ite militia, posted a photograph of himself Monday visiting Kirkuk. Last week, he said his militiamen would regard the Kurdish peshmerga an “occupation force” in the event the Kurds formally annex the oil-rich province and city of Kirkuk. Other Shi’ite paramilitaries have issued similar dire warnings, including the leaders of Imam Ali Division, who have hinted Tehran has given them the go-ahead to attack. 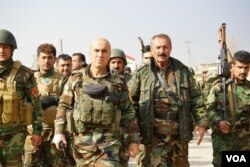 “Kirkuk belongs to Iraq," Abu Azrael, spokesman for the faction, said earlier this month. “We would by no means give up on Kirkuk even if this were to cause major bloodshed,” he said. To add to the worrying picture, on Monday Ali Shamkhani, secretary-general of the Iranian national security council, said not only would Iran impose a blockade on Iraqi Kurdistan. “Iran would then prepare itself to enter areas deeper than the border in response to anti-security actions,” he told the state-owned IRNA news agency. Turkey is also flexing its military muscle, holding previously unannounced military exercises on the border with the Kurdish Autonomous Region. So come the vote on September 25, will Iraq be plunged deeper into turmoil, distracting the country and the international coalition from the war against Islamic State? The best hope to avert a war partly rests with Tehran, say analysts. And Barzani can help with that. Turkey's Armed Forces officers in tanks take part in a military drill near the town of Silopi, Turkey, close to the Habur border gate between Turkey and the autonomous Kurdish region in Iraq, Sept. 18, 2017. No one doubts the Kurds are playing with fire but statements this week from Kurdish leaders suggest they will be highly cautious on how they proceed after the vote, including avoiding a formal declaration of independence. “While the referendum could generate the momentum for Kurdish independence, as well as formalize the process, it will have no immediate administrative and organizational impact, since the vote will not be legally binding,” according to analyst Ranj Alaaldin. Whether serious fighting begins the day after next week’s referendum — no one doubts a majority of the Kurds will back independence — will depend on the restraint of the governments in Baghdad and Tehran, and that in turn will hinge, analysts say, on whether the Kurds announce an independent state immediately and move to annex disputed territories such as Kirkuk. This week the KRG government has gone out of its way to frame the vote as part of the process towards independence, hinting the referendum will mark the start of likely lengthy negotiations with Baghdad — as well as talks with minority groups of Christians and Turkmen. Kurdish officials say they have increased the territory under their control by as much as 40 percent in the fight against IS, much of it where large numbers of non-Kurds live, such as Kirkuk province. And this newly seized territory could turn into an effective bargaining chip in any future talks. FILE - Prime Minister of the Kurdistan Regional Government in Iraq, Nechirvan Barzani (L) speaks to VOA's Ali Javanmardi (R) about various regional issues. The military strength of the Kurds will be another factor shaping the response to the vote by Iran — and Baghdad’s. “Iran, federal Iraq forces and Iranian-backed Shi’ite militias are unlikely to seriously threaten the well-prepared Kurdish defenses,” predicts analyst Michael Knights of the Washington Institute for Near East Policy, a U.S.-based policy research group. The Kurds have been preparing themselves militarily for confrontation with Shi’ite militias for months. For reporters covering the military campaign by Iraqi security forces and the Kurdish peshmerga to oust Islamic State from Mosul and surrounding towns, it was instructive last year to see how focused the Kurds were also on building new border defenses. As the peshmerga struggled to oust IS militants from Bashiqa, a town near Mosul inhabited mostly by Yazidis and Shabaks, Kurdish engineers were busy at the same time constructing massive dirt berms and barracks, undistracted by intense fighting nearby. Strong defenses and talk about negotiations may well limit any post-vote violence. “This dynamic will drive Baghdad to kick the can down the road by offering new negotiations,” forecasts Knights.